“Every band we ever loved/Is selling out and breaking up,” sings the quartet known as The Henry Clay People; the quintessential lament of twenty-somethings struggling to find a place between growing up and out. 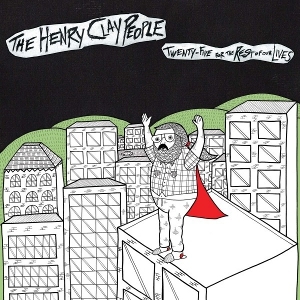 Anyone who haunts all the cool venues in the greater Los Angeles area has encountered The Henry Clay People at some point, and their new album Twenty-Five For The Rest Of Our Lives is a punk-laced, introspective offering to their rabid fan base. HCP specialize in the infectious shout-along tune. Try and keep from going hoarse when you sing along with Joey and Andy Siara to the title track or “EveryBandWeEverLoved.” You hear the echoes of influences like Pavement and The Replacements, but with strong storyteller lyrics that shows wisdom beyond their years. The Brothers Siara construct the ennui of the young adult with their clever lyrics, grinding guitars, and raucous rhythm section (Eric Scott on drums and Noah Green on bass). Twenty-Five For The Rest Of Our Lives is a solid, fun album that will be sure to rock even harder when you hear it live.